Data suggests on a national level, 90 percent of children in the US have an online history by the age of 2. At 5 years of age, 50 percent of children are regularly using electronic online devices and 95 percent of teens (12-17) are regularly online (Devon). This familiarity and access to the Internet and technology doesn't necessarily translate to the requisite knowledge and skills about how to use the Internet properly. Students typically spend far more time with gaming and social media than they do utilizing online tools that will help teach and expand academic knowledge. So for us, as parents and teachers to assume our students know more than we do about technology and online applications is naively delusional. They may know more about how to hook up with someone on Tinder or how to download music on Pirate Bay, but in turn, may know considerably less about how to protect their own privacy or to realize the importance of respect the rights of others online. 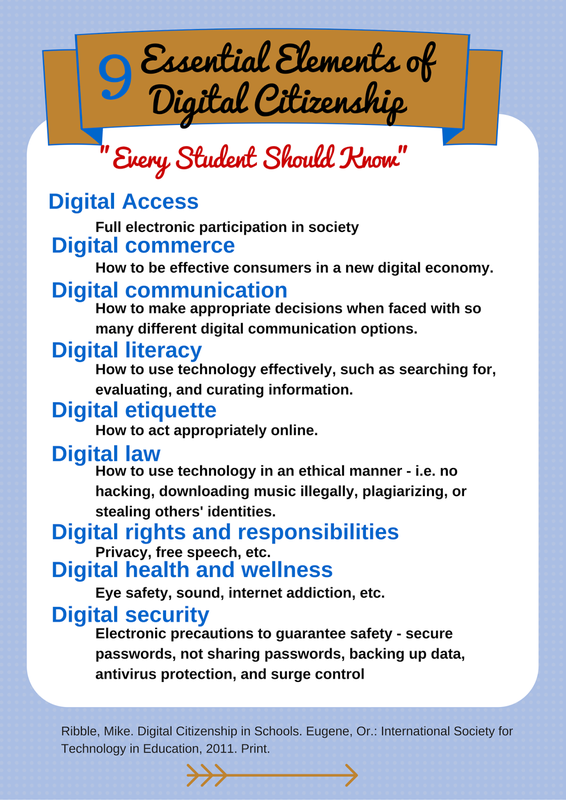 The tenets of digital citizenship are ours to teach as adults and teachers. 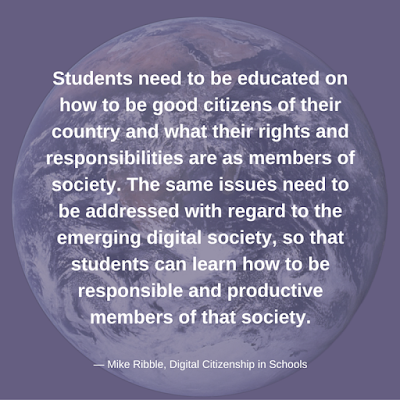 Digital citizenship guru, IT Director and author, Mike Ribble, believes many teachers and students are lacking basic skills, not just in technology, but "basic human skills" like "respecting other people"(O'Connell). 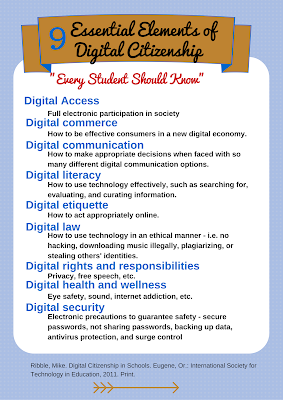 His book, Digital Citizenship in Schools, puts forth nine essential elements of digital citizenship that need to be incorporated into what our students are learning. Do you try to make sure that all your students have access to their school netbooks? If so, that addresses digital access by providing full electronic participation to your students. Do you instruct your students on the proper behavior and etiquette required in your classroom? Expand that a bit model and remind them of the proper digital etiquette they should be using online. You can get the idea. Traditional learning and ethical skills are transferable to the digital for the most part. Sometimes you will need to expand and change the lexicon a bit, but the idea is the same. Ribble believes "technology isn't something different . . . literacy is ongoing" and should continue being taught in its digital context (O'Connell). Use programs and apps you're already using. If your school uses an LMS such as Edmodo or Canvas, utilize that system. You can upload, share and discuss all sorts of resources and case studies while tying them to your content. Model positive social interaction and instill a respect for other's work in your discussions on blogs and backchannels or while file sharing in Google Docs. 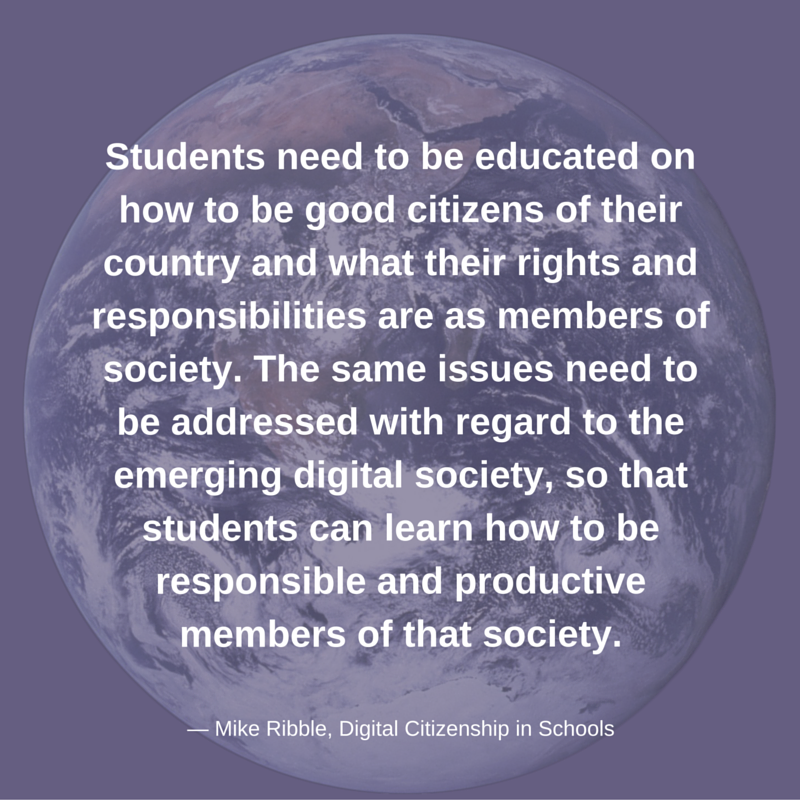 Think about what upcoming activities you have planned in your lessons and use high yield learning strategies that engage your students while driving home Ribble's Nine Elements of Digital Citizenship. Also, teachers don't have to create new content nor do they have to go it alone. There are plenty of resources available such as my two favorites: Commonsensemedia.org and Netsmartz.org. Commonsensemedia.org has literally everything: a complete curriculum, downloadable resources, a certification program, videos, and more. Netsmartz.org is sponsored by the National Center for Missing and Exploited Children and promotes protecting and educating all children regarding Internet safety. They provide presentations, lessons and great case study videos to share and have particularly good resources for teens/tweens. Students need to be educated on how to be good citizens of their country and what their rights and responsibilities are as members of society. The same issues need to be addressed with regard to the emerging digital society, so that students can learn how to be responsible and productive members of that society. The process of teaching these skills is ongoing and evolves with technology, but by sharing our resources, skills and ideas, we as educators can create a community of content that will ensure our students success in this digital world. Ribble, M. (2011). Digital citizenship in schools. (2nd ed.). Eugene, Or. : International Society for Technology in Education.